At Aluminum City, we believe in providing each of our National City clients with personalized service and high-quality products. 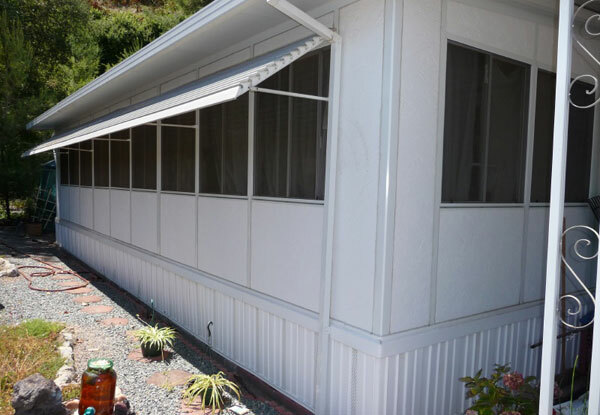 Established in 1963, our company has designed, sold, and installed thousands of residential and commercial patio covers, awnings, door hoods, pergolas, carports, and outdoor living rooms throughout the San Diego and Southern California region. Our patio covers and awnings not only provide protection against the sun, they also help to dissipate heat away from your National City property. At Aluminum City, our goal is to build a product that you're proud of and that will endure for decades. Our patio covers and shade solutions are all long-lasting, durable, virtually maintenance-free, and highly affordable. 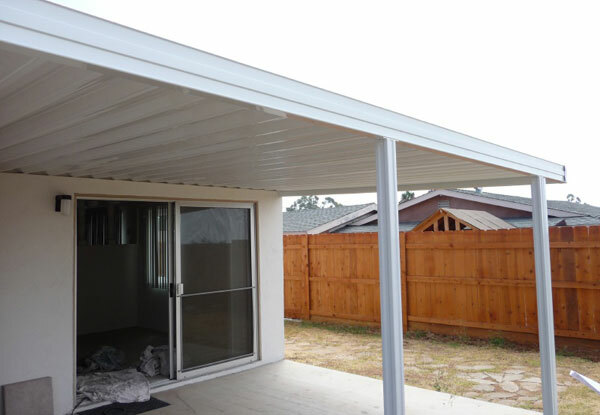 In fact, our patio covers and other shade solutions aren't just affordable; we're the best value in San Diego County. Our owners perform all of their own consultations and installations, and ensure that we consistently meet the highest of industry practices. Each of our owners has worked with patio covers since they were young, and hold over thirty years of hands-on experience. Because all work is done by the owners themselves without any employees, salesmen, subcontractors or middlemen to worry about, Aluminum City is able to offer pricing that is lower than nearly all other competitors. Call us today. We're open seven days a week, from 7 a.m. to 10 p.m., and it is our company's owner who answers and returns all phone calls. We provide free on-site estimates for our National City clients, and typical project turnaround time is 2-3 weeks. Aluminum City holds an A+ rating with the Better Business Bureau and is licensed, bonded, and insured. A superior-quality patio cover begins with superior-quality materials. That's why Aluminum City relies exclusively on the building materials from Four Seasons Building Products. They provide a Lifetime Limited Warranty; They are also the only manufacturer that primes their aluminum prior to painting, and offer product that is thicker than the industry standard. 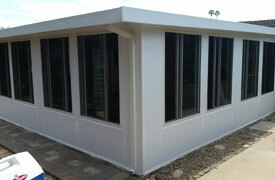 Aluminum patio covers feature a solid, lattice, combination (partially solid and partially lattice) or insulated top. Additional options include one of six colors, smooth or wood-grain texture, one of four rafter end cuts, various types of column posts, and freestanding or attached. 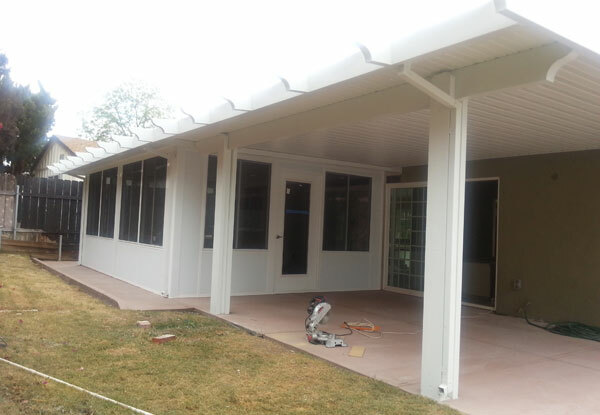 Aluminum City builds long-lasting awnings to go over windows on residential or commercial properties in National City, California. Our window awnings are constructed from 3-inch aluminum slats set at a 45 degree angle on the outside of your building, for a classic mini-blind look. We've built and installed window awnings for San Diego office buildings, retirement homes, apartment complexes, condos, Navy bases, police departments, restaurants, and more. Designed to last for at least forty years, our awnings are extremely reasonably priced, and both a cost-effective and low-maintenance alternative to fabric window awnings. Our window awnings are available in twenty different colors and are manufactured by Four Seasons Building Products. Door hoods can be a great addition to any National City property. Our business has crafted door hoods for apartment complexes, condominiums, stores, homes, and more. 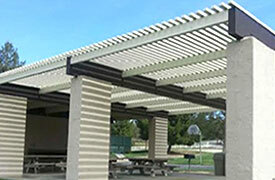 With over thirty years of experience working with shade solutions, we can help clients in National City determine the best product and design for their needs. Our door hoods are manufactured by Four Seasons Building Products who use high-quality materials and expert fabrication. Clients get to choose between twenty different door hood colors for further customization. Each of Aluminum City's door hoods is custom-made for a perfect fit, and we offer fast turnaround and a long-lasting material and design. 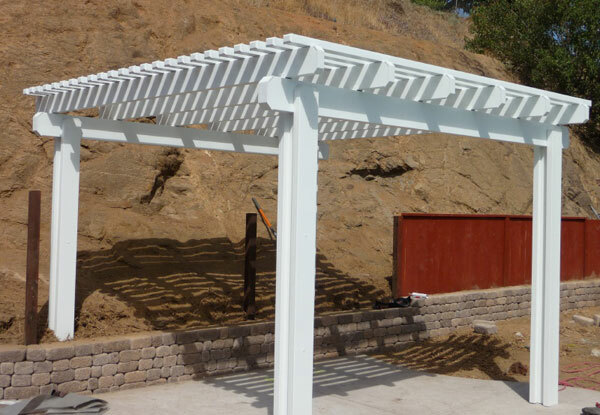 At Aluminum City, we craft beautiful pergolas (essentially lattice-top patio covers) for our National City clients. These patio covers can be customized to fit your shade and aesthetic preferences, and we offer design recommendations to complement the style and decor of your business or home. Our pergola patio covers are available in six different colors. You can also choose between different cuts (bevel cut, corbel cut, miter cut, scalloped cut) and columns (standard 3x3 column, square Roman columns, round Roman columns), as well as incorporate a wrap kit to add further thickness to your patio cover. Because our pergolas are made of aluminum, the product is sturdy yet lightweight, meaning it won't pull on the walls of your National City property or crack the surrounding cement. Furthermore, the material requires virtually zero maintenance. Termites cannot eat aluminum, and our pergolas will not rot, bubble, flake, or rust. 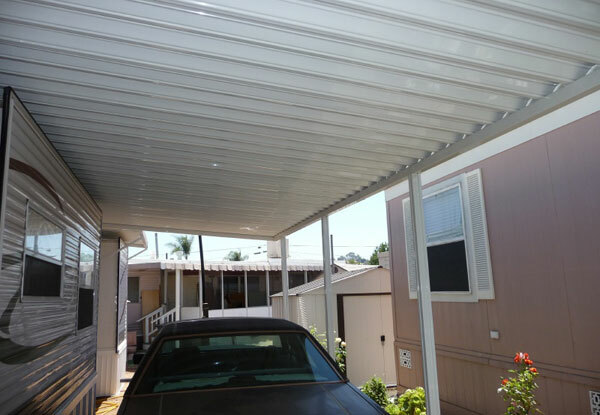 We design, build, and install carport awnings for homeowners and businesses in National City, California. Our carports can be freestanding or attached, and customers use them to protect their vehicles, shield sensitive equipment from the elements, improve privacy, and to expand their workspace. 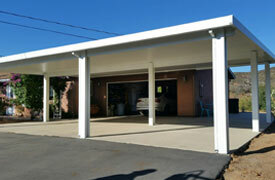 Every carport we offer is fully customizable to meet each National City client's unique preferences and needs. When it comes to design, we'll look at your building and surrounding property to come up with an appropriate look. We're highly experienced in aluminum work, and have crafted carports for a single vehicle to 100 vehicles. 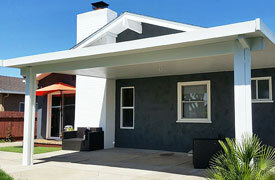 Our California Rooms are a popular option for National City clients that wish to create an outdoor living room or bonus room on their property. These outdoor patio rooms or sunrooms are built with 4-inch insulated walls and an insulated patio cover top filled with polystyrene foam. We fit your patio room with dual-pane, low-E windows for added energy efficiency, and clients can choose between a regular, sliding glass, or French door. Upon request, we can have our licensed and bonded electrician install ceiling fans and lights in your outdoor living room. (The insulated patio cover top is built with center channels to contain electrical raceways.) Aluminum City can handle any needed permitting, and we always abide by local city code. The size of your outdoor patio room can vary, and the room's insulation will help save energy and ensure protection from the elements and sun. 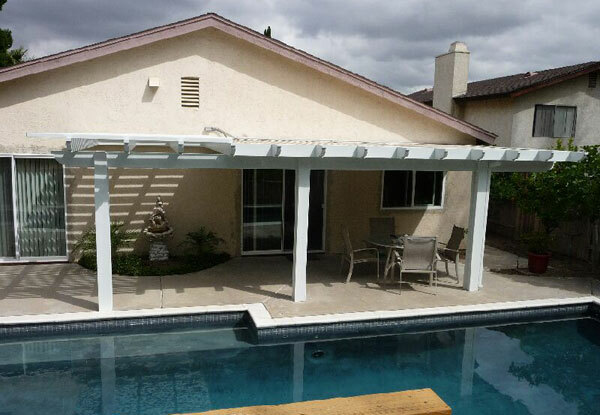 This installation of an attached aluminum patio cover in National City, CA includes beam, wrapped posts, corbel cut ends, and a wrapped fascia.